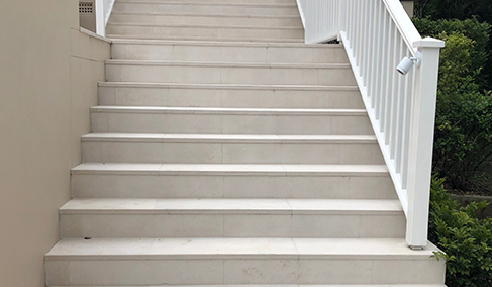 Growing demand for larger format tiles has seen the expansion of Sareen Stone's range of Limestone and the return of Tavira Limestone Alfresco large format 20mm tiles into the warehouse. Teamed with the larger format coping in 30mm with a pencil round profile on one long edge, these alfresco limestone tiles create a beautiful poolside oasis. Sareen Stone's Tavira Limestone Alfresco is a lightly coloured limestone with an elegant yet relaxed ambience echoing the sand on the beach. Its durability, together with the lovely markings in this stone, makes it extremely practical for flooring in high traffic areas. Tavira Alfresco Limestone makes a brilliant choice for any outdoor area be it for entertaining, external walkways or pool surrounds. 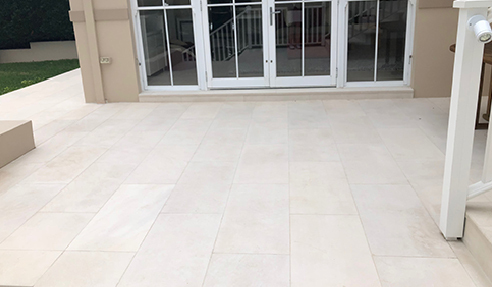 This beautiful limestone has a lightly textured finish ensuring it works perfectly for both covered and uncovered outdoor spaces. For more on Tavira Limestone visit www.sareenstone.com.au.